Thanks for all of the amazing support and love you have shown me over the past days! For the continued encouragement and for giving me the energy and inspiration to knuckle down and get on with things! Part of my "getting back into it" has included a mega blitz of my apartment, sorting out the old and unused and making space for a calm and less cluttered environment. I kind of live by the mantra "messy apartment, messy head". Let"s just say for the past months my apartment has been a war-zone, imagine what my head has been like! So at some point I needed to get things together and sorting through my belongings seemed like the place to start. I went through every room. I emptied drawers and decluttered. I went through my wardrobe, Did I wear that this year, no? Then off to charity it goes! I've been ruthless to say the least and it"s felt insanely good to have a little less of everything. My final room that need the declutter, was the craft room. 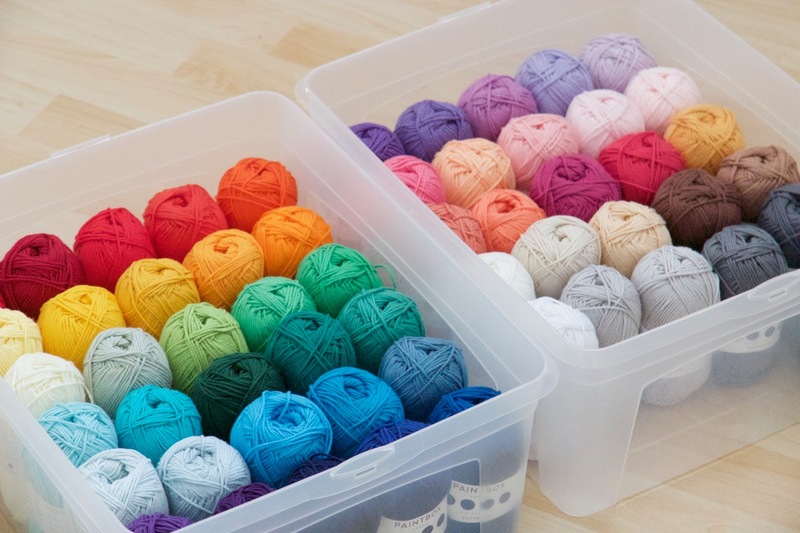 Do you realise how many random balls of yarn I had accumulate over the past years!? All bought with an idea in mind, but placed in my yarn box and somehow forgotten. I tried to sort it, to reason with myself, but I was terrible at deciding and so I rather abruptly decide to get rid of it all! To start fresh. I sorted the yarn into bags; new balls, nearly new balls and scraps. I made sure to keep the yarn I needed to finish off projects that had already been started. Other than that, it all went! I gave the majority of it to a seniors home down the road and the rest is boxed up and ready to send to my Mum, so she can dish it out to her friends. 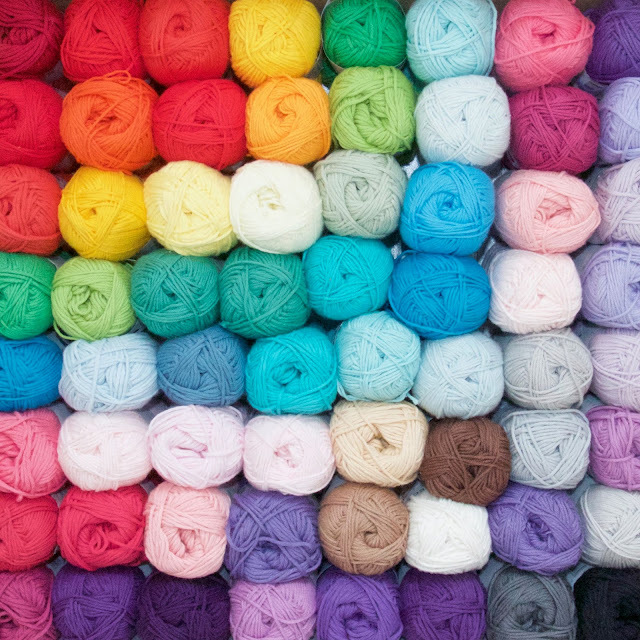 I had seen this yarn popping up often on Instagram and was mesmerised by the colour selection. This is Paintbox dk and I'm in love!!! 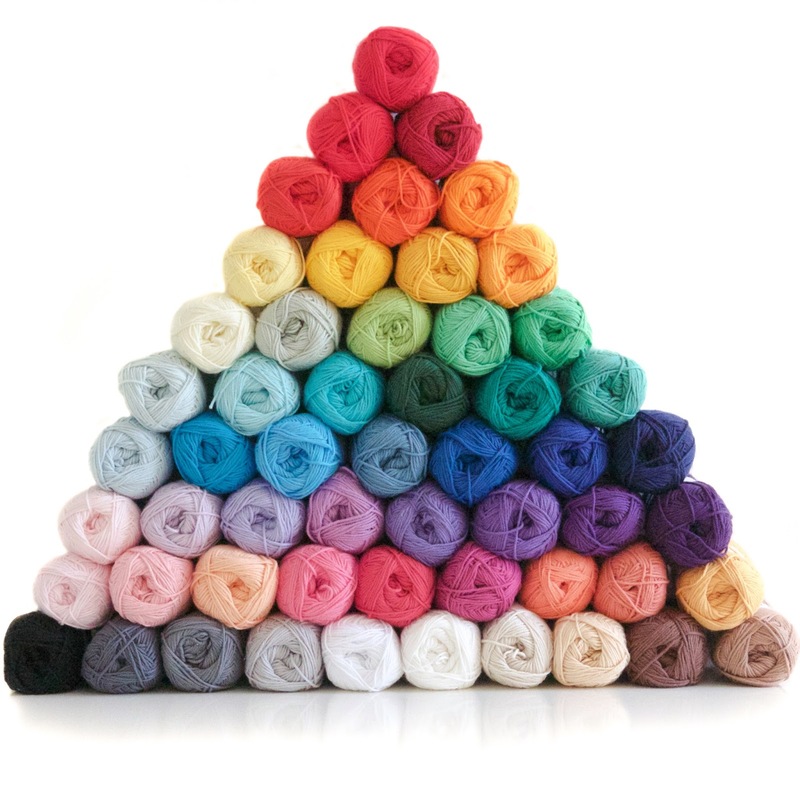 It"s a dk weight cotton that comes in 56 colours. As I'm really into playing around with smaller projects and amigurumi, I've pretty much only been using cotton over the past months. The cotton I can get locally comes in 8 colours, but the yellow doesn't match the color range (frustrating to say the least). So I splashed out on this and got the colour pack from love knitting.com. It was pricey to buy the whole lot in one go. I had a browse online and found that it was far cheaper to order from the German website than the English (€50 cheeper!!!!!) and I could use a discount code that gave me 15 percent off. So I got all 56 colours for just over €100! That is pretty good value if you ask me!! The yarn arrived and I was over the moon!!! It's really gorgeous, amazing quality and as hoped....the colours were EVERYTHING!!!! Being freshly decluttered and having lots of space, I organised the yarn into crates so that I could easily see all of the colours as well as easily access it. Having a selection of colours at hand is really inspiring me to create and get working on new pattern designs. Sometimes I"d get frustrated towards creating because I didn't have the correct colour for a project, hence the ever-growing stash of yarn that I once had. You know me...... 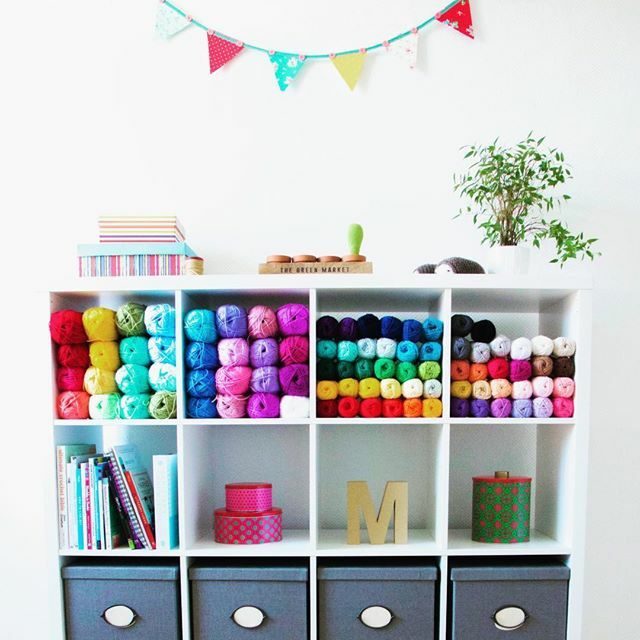 I had to take the yarn out of the crates for a nice picture!!! YUMMY!!! Here it is with my stylecraft yarn! my complete stash!!!! Aren't you proud!!! ok...so I do have some more yarn on the way, but it"s for a project....I swear!!! Do you think I have a stash problem? I rest knowing that I'm definitely not the only one. I always love your stash pictures. Makes me smile, cause it's so colorful! You must have had a lot of strength to give away your old stash haha. I'm now working on a Heidi Bears pattern to get rid of all my old yarn. It's still on my bucket list to buy the full color range of one brand! Have to start saving money for it haha. And that support group... sound like a plan hahahaha. Oh wow, those blues and greens are absolutely amazing! Starting fresh is definitely a nice idea. And I think it's fantastic that you gave your yarn to a senior home. It's a very nice gift. Have fun working with that new yarn! It looks fantastic!! Aren't they lovely, there is a really lovely bright aqua colour...its my favourite! I’m glad you’re doing well. Your pictures are always ‘yummy’, perfect word for it. I’ve decided to give up crocheting, as much as I love it, I’m not any good at it. So I will vicariously live through your projects, and I’m happy with that. And you’re so sweet to give your yarn to a senior home. I gave my yarn to a group that makes nests for an animal rescue group. I look forward to seeing your new creations! NOOOOOOO don't give up, just take a break and give it another go. I was terrible in the beginning! You can do it, you can do it!!! You inspired me to take up crocheting at the ripe old age of 56. I haven‘t done it since primary school. Thanks and count me as your fan, I‘m glad you‘re well. 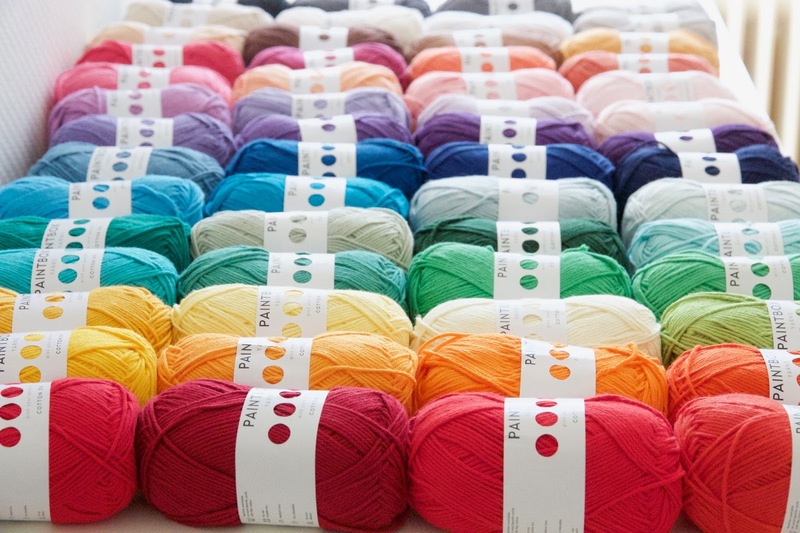 oooooh...that gorgeous yarn is like a big stash of colourful jelly beans in all flavours! I can't wait to see what you create with your new yarn, Matt. It"s rather yummy, isn't it!!!! Wow, the colors are beautiful! I can't wait to see your new projects.